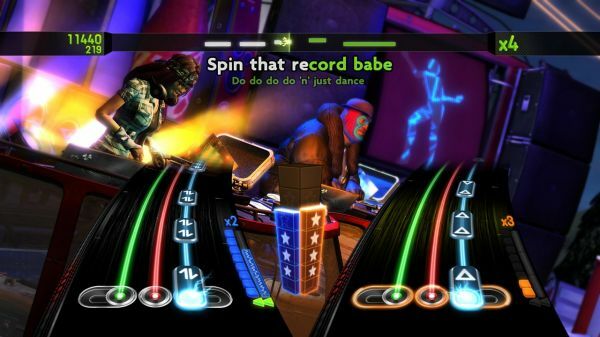 The DJ Hero 2 party bundle is a perfect solution to turning your house into a virtual nightclub. I think this is the best bundle I have seen since the original Rock Band pack and hell – it takes up less space and provides another great party experience. The bundle comes packed with a similarly constructed turntables in both white and gray with a glossy finish as well as a USB microphone. Like I said, the quality is similar, if not a little better, than DJ Hero 1’s hardware. DJ Hero 2 adds the ability to plug in any USB microphone (I was able to use my Rock Band mic) and have someone lead on vocals while two people on the turntables can remix all night long. I will say that in theory this is a great idea and it does provide the grounds for a fun coop experience but I will warn you that the mixes are very difficult to sing/rap if you don’t know the songs. Even if you do know the two songs in the mashup they are cut so differently from the originals that you will have a hard time finding your way around and it will feel like catch up on every line until about three quarters way through the song when you are comfortable with how the lyrics are laid out. I know this will come with practice, but it was a bit jarring and didn’t have the same accessibility as say jumping into party mode on a rock band song. Again, great in theory but just be prepared to jump into the deep end and have some fun with it. This is the game’s sole co-op mode with the gameplay mostly identical for both DJs. Really it's just a bunch of people playing the game together for the sole purpose of enjoying the music and having fun. The game also includes online leaderboards which display while playing, and the ability to issue challenges to friends is a welcome addition. Going back and forth on a score between you and your closest pseudo-DJ friends has an addictive quality to it, but the real fun comes when you go head to head in an online battle over a number of the modes ranging from normal star ranking to an accumulated combo mode. There are numerous battle modes that you can do both online and in person, making for a great lineup of epic DJ battles. I can’t go without commenting on the music, as this is the focal point of the game and DJ Hero 2 blew me away. Simply put, I have never heard such a consistent soundtrack in a rhythm game. For 75% of the soundtrack I was totally entranced in the mixes and wanting more at the end of each song. DJ Hero 2 has the ability to mix two songs that normally don’t belong together and the result is me bumping along to music that I could not tolerate beforehand. On a personal note I could have done without all the Kayne West in the game, but the other 75 mixes make up for it. Activision has flexed its licensing muscle for the greater good this time I can’t wait to buy the soundtrack because it is out of this world. The game is empowering. It makes you feel like an actual DJ and you are no longer simply playing along to the music. You get to put your own personal spin on each and every track and the amount of control that the game grants you is invigorating. The freestyle aspects of the game add replay value since no song will sound the same and you can always change. If you missed out on the first DJ Hero jump straight to this one and if you want to transform your basement into a night club then this will do the trick. 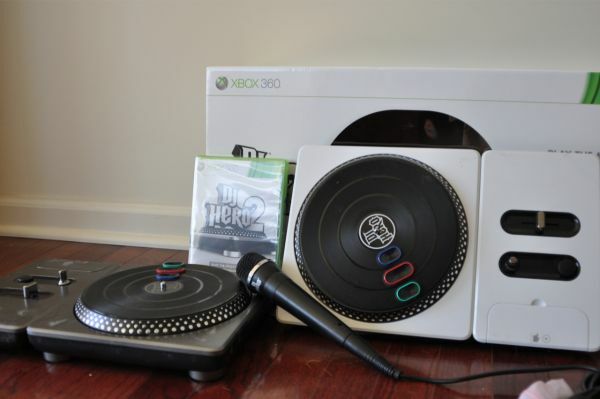 Grab a couple friends and have a party because DJ Hero 2 will make it so you have to start charging people cover at your door. The Co-Op Experience: Players can drop in and out of party play using either a turn table or microphone. �Up to two turntables can be played at the same time.